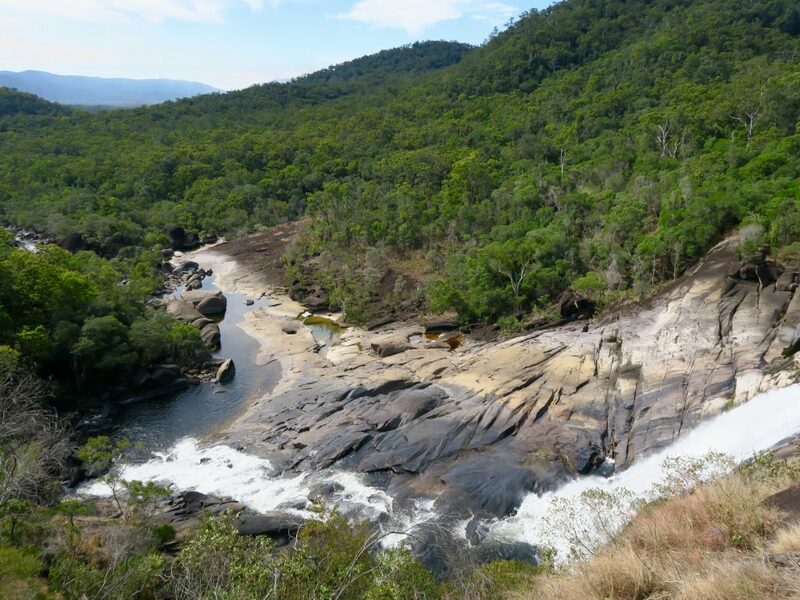 Just back home from a month exploring Cape York in Shorty. Drove the Old Telegraph Track, Frenchman’s, Five Beaches and last but not least the CREB. Was a great trip with all the excitement and challenges you read about and see online…..but one night was a little different. I have attached a copy of my blog for your interest. Hope you enjoy. 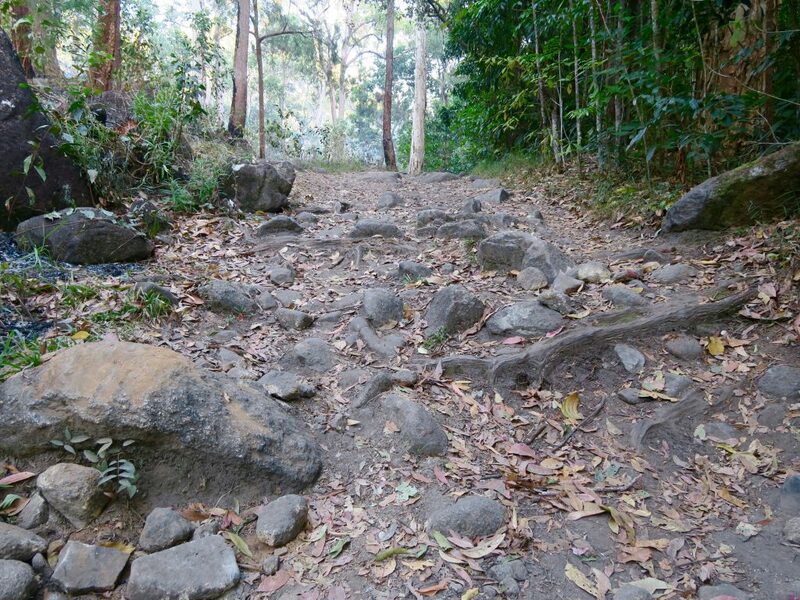 Yesterday we set out to conquer the Cairns Regional Electricity Board Track. 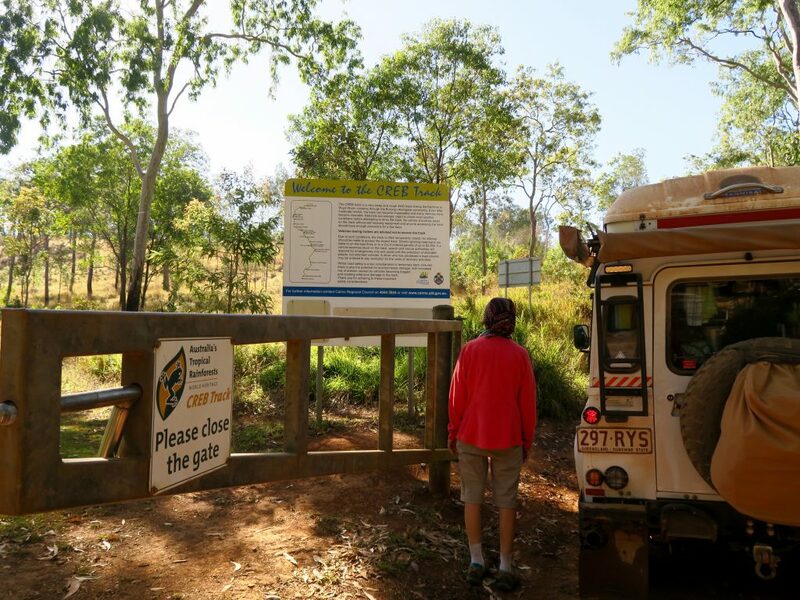 Just over 60kms long, all the books say it is one of the most challenging 4×4 tracks in North Queensland…taking about 6 hours. We were driving North to South. Like most tracks it started easily enough. Well graded track as far as Roaring Meg Falls. Around 3pm we turned up a track to Roaring Meg Falls. Beautiful spot and certainly worth a visit. The track in was typically rough in places. After 2.4km hike to the falls we set up camp for the night in a camp site clearing in the rain forest…just big enough for our convoy of 4 vehicles. Being up high on the mountain it was a little chilly, so we were cooking lamb stew at dusk when we heard crackling over the sound of the water crashing over the falls. As it got darker we could smell smoke and see a glow through the trees. We went to investigate and found a roaring bush fire heading our way! The local aboriginals light back burning fires all the time but this one must have got away. The wind was changing all the time which threatened our camp, so we made the decision to quickly pack up camp and be ready to move.The fire was heading along the track straight towards our camp site. The wind direction was also changing making it impossible to accurately predict path of the fire. 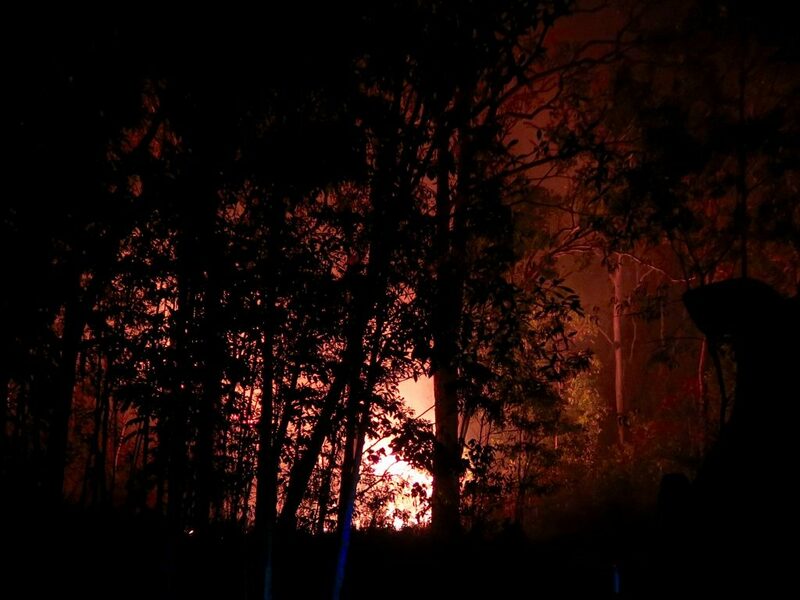 We could see from the smoke and flames that the aboriginals …led by an Elder and the Ranger…had also lit more fires in the area……and as it was dark we didn’t want to risk driving that rough track and maybe become trapped between fires. 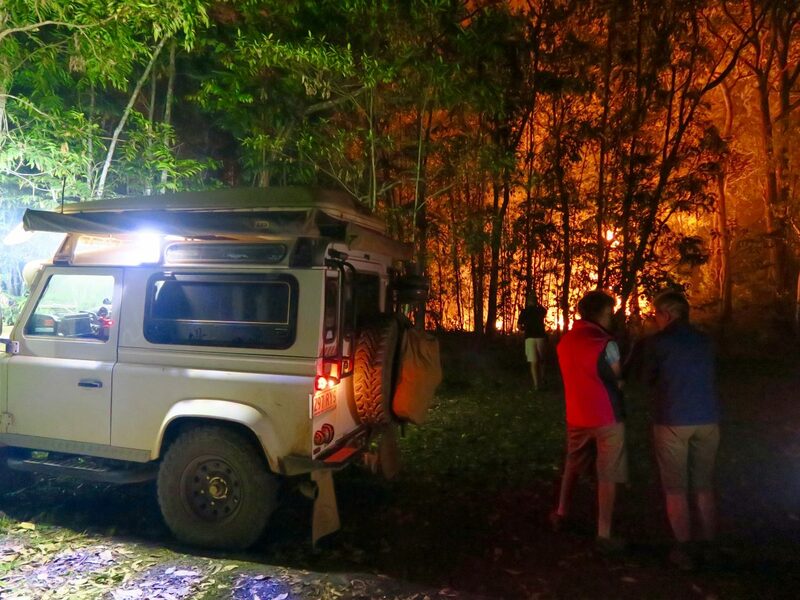 A torch and bushfire lit walk along the track past the fire, revealed a small turnaround clearing in the rainforest just big enough to take our vehicles. We decided that our best option was to move past where the fire had already been. 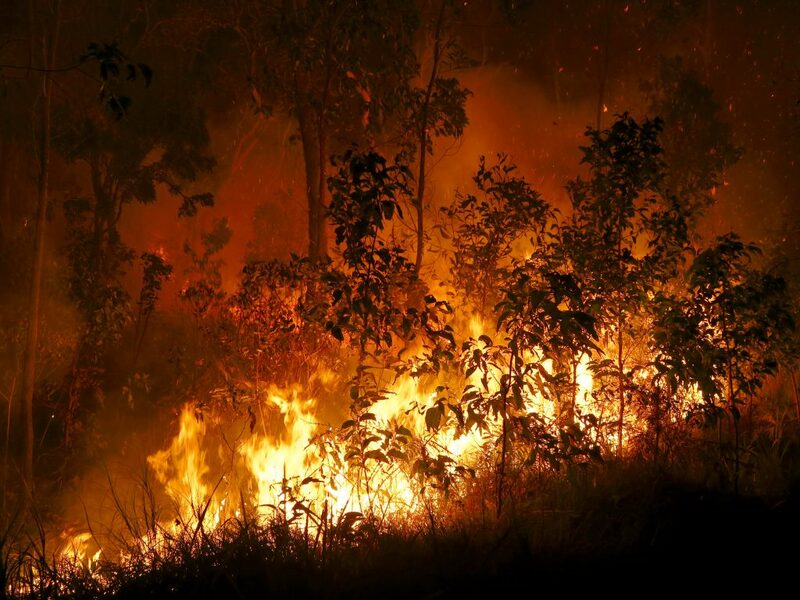 When the fire had nearly passed by this clearing we returned to the official campsite …….which was now starting to feel the heat of the flames and embers……and drove alongside the raging flames and into our safe hole in the jungle. And that was where we spent the night. We were showered with embers and surrounded in smoke as the fire passed by…then had a restless smoke filled night as burning trees crashed to the ground in clouds of sparks around us. We cut down some saplings and used them to beat out the flames as they approached or location. 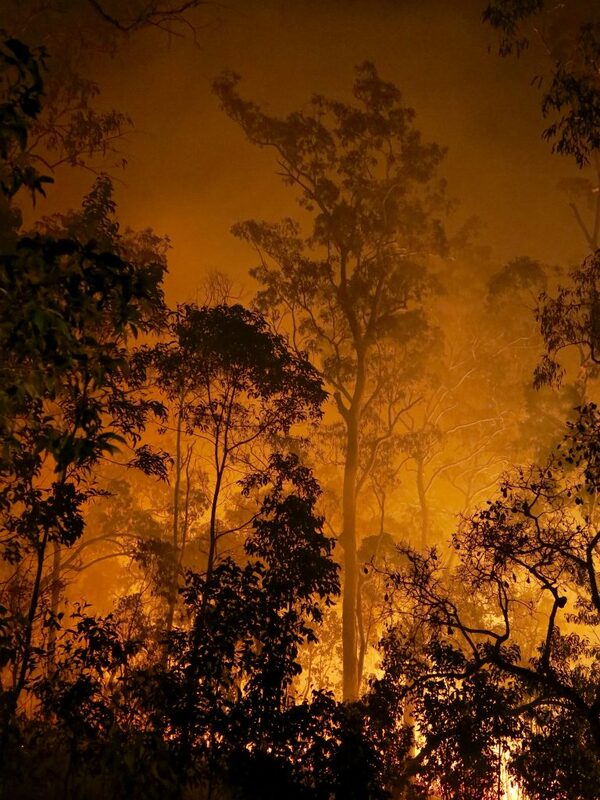 Also very aware that this region is known for it’s huge Taipans….which could also be fleeing the flames….hmmmmm! Was quite a show for most of the night….didn’t get much sleep, but up in our rooftop camper we were better off than two couples of our group who were forced to sleep in their swags in the centre of our corralled vehicles. It would be unwise to erect their tents with all those embers in the air. 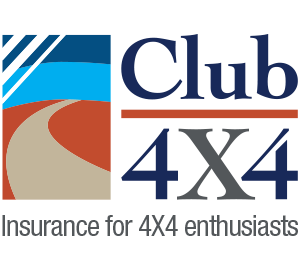 The question of whether we were all insured came up and two of the four vehicles were with Club 4×4. 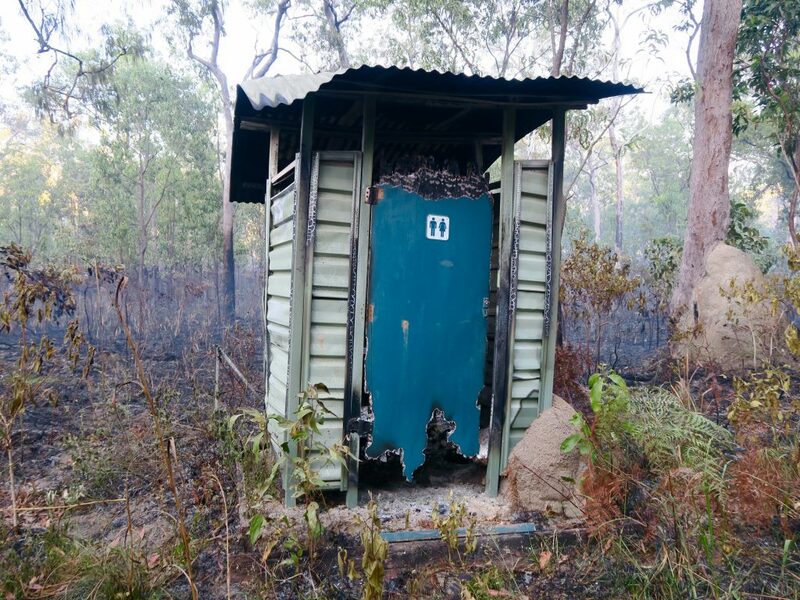 Lucky we moved, as this was all that was left of the toilet block at our original camp spot! Oh yes we completed the CREB track today….a must do ….very scenic drive….though pretty steep and slippery most of the way. One of our team phoned and spoke to the Elder who set the fires….he was very apologetic and promised that next time we visited he would take us to a special place for a smoking ceremony……nice offer but think we have had enough smoke for a while. My husband Mike did not mention that we were not the only ones trapped by the fire. We had noticed a young couple camping at the Beach area some 400m further along the track. Think Mike said their names were Steve and Anita from Kuranda….with a 10 week old baby! When we first heard the crackling of the fire, my husband was concerned and slipped away telling me he was going to check on them. I was busy helping with the meal as we were not under threat at this time. After 45 mins Mike had not returned so I walked along to track heading towards the fire to see where he was. It was then that I realised just how big the fire was. Mike was heading back and told me that for the last half hour he had been helping Steve thrash out flames to save his camp whilst his partner sat terrified clinging to their baby. We then hurried back to warn the others that we had make some decisions. Happily it all ended well for everyone.